Take a casserole (or any oven-proof dish) and place on the hob over a high heat, pour in the olive oil and when hot, add the lamb shanks, turning occasionally until brown. Once nicely browned, remove the lamb from the pot and add the chopped leek, celery, carrot, onion and garlic cloves. Stir all together and add the bay leaf, thyme and rosemary. These ingredients will add flavour to the dish but won’t be served at the end. Once the vegetables are lightly browned, place the lamb back into the pot, allowing it to rest on top of the vegetables. Pour in the red wine and chicken stock, and bring to the boil. Cover the pot with a lid or kitchen foil, and place in a 150oC/gas 2 oven to braise for 2 hours 30 minutes or up to 5 hours depending on the amount of lamb you use. 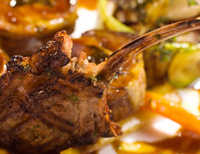 Serve the lamb shanks with the cooking juices poured over the top.